Another busy week of weather is in store for our viewing area. We are watching Michael, which is now a hurricane and will continue to strengthen over the next 48 hours. Areas from Pensacola to Apalachicola need to be on alert for this dangerous hurricane. I expect the intensity of Michael to be either a strong category 2 or even category 3 storm at landfall. We must watch for some of the same areas that were flooded by Florence recently, because Michael very well may cross these same areas. 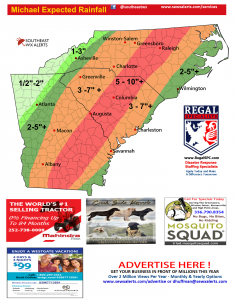 This is NOT Florence and will NOT produce as much rain but I am worried that some areas inland could still see another 5-10″ of rainfall from Albany, GA through Raleigh, NC. 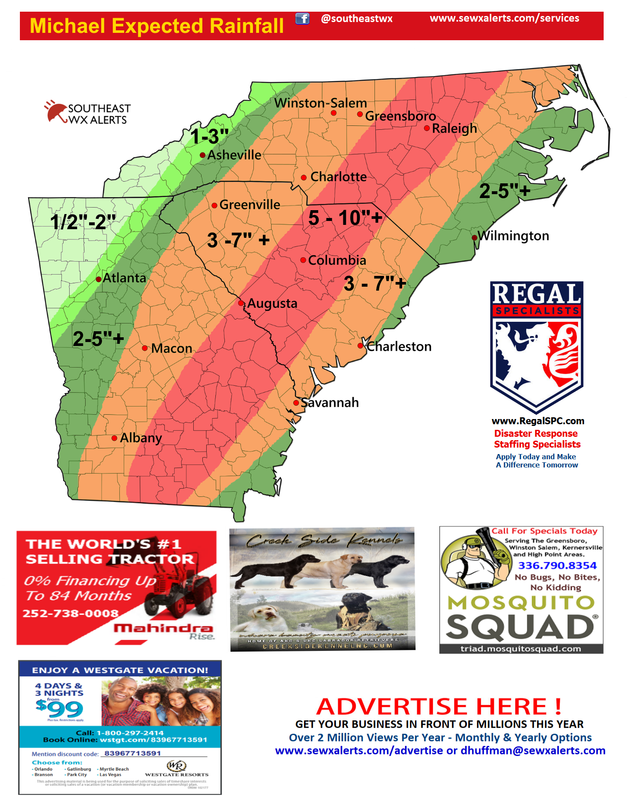 However, even areas outside of the heaviest rain swath could see totals of 3-7″ across a wide area. Hurricane Michael will be on the move and we do not expect a slow moving storm, but even so high winds and heavy rain will still be a very real threat. The high winds may be the big story this time as the storm gets caught in the fast flow of an approaching cold front. Any deviation in the track east or west will move the associated wind, rain and tornado threat as well. Right now the tornado and severe threat appears greatest between the I-85 and I-95 corridors. The timing of this system appears to be Wednesday morning through Thursday evening across Southern GA and through the Carolina’s. Not to minimize the threat from Michael but we have a good chance of the first frost visiting areas of Northern/Western NC and extreme Northern GA for the first part of next week. Lots of weather going on at the moment!